Fair warning: this is not related to bird research at all. 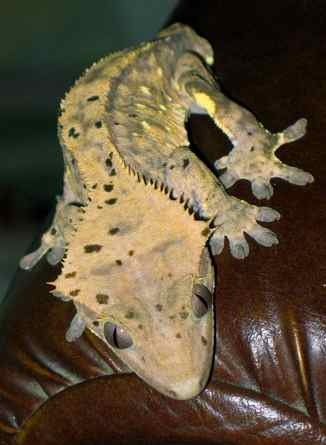 I’ve had pet crested geckos (Rhacodactylus ciliatus) for about four years. 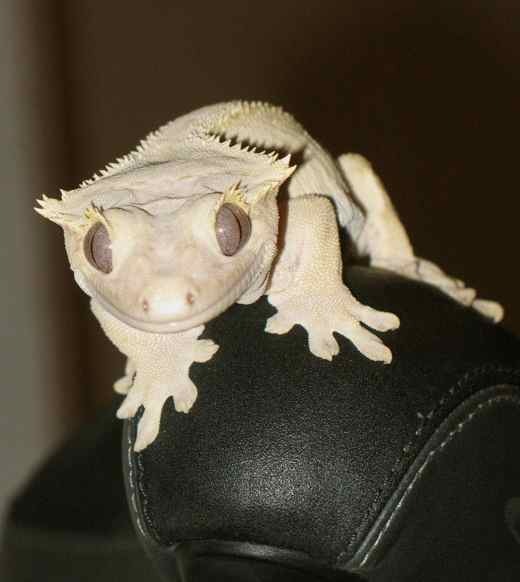 They’re great little animals for a busy grad student because they’re low-maintenance, not emotionally needy, and they look like tiny smiling dragons. Last year my big female, Corusc, starting laying infertile eggs, and I decided that if she was going to be investing protein and calcium in something, it might as well be fertile eggs. So I put her together with a male, Zenith. She only laid one clutch of two fertile eggs before it starting getting too cold to breed. So I put the eggs in a little humid box with hatching material and left them alone. 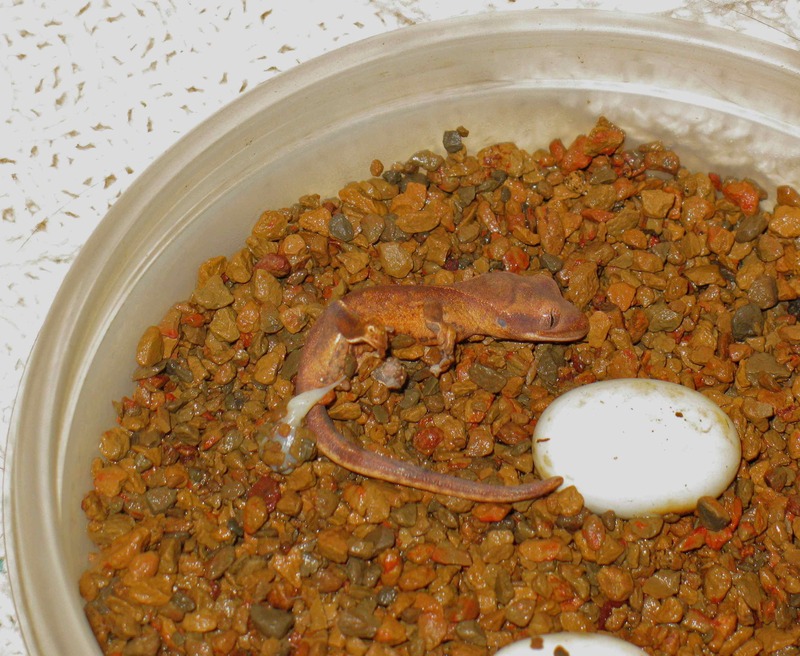 Crestie eggs are supposed to take 65-120 days to hatch, depending on the temperature. 120 days came and went, and I figured that the temperature in my room probably was too low and had killed the eggs. But they say, “When in doubt, don’t throw it out,” so I left the eggs in their box. This little guy was laid on October 4th, 2011. 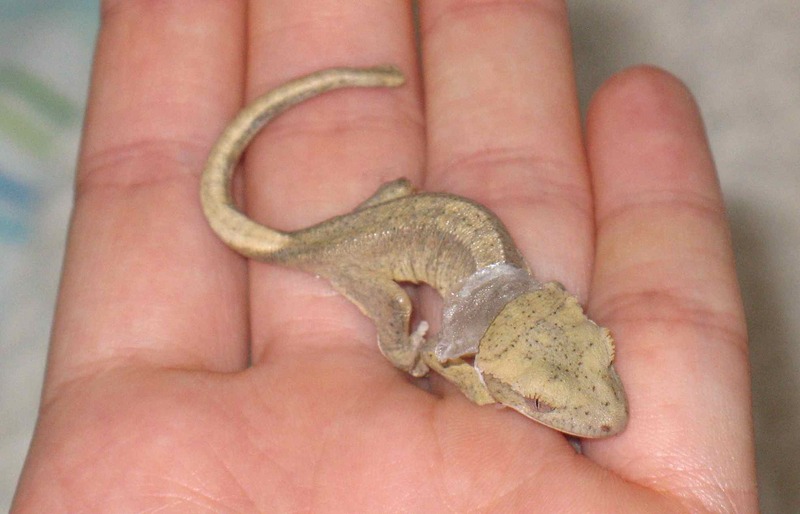 He took upwards of seven months to hatch – that’s more than 210 days! I’m completely floored that he exists. This morning he had lost his just-hatched redness. He wedged himself in here overnight. That’s the top half of an egg carton behind him. He also has begun his first shed. Shed skin bunched up behind his head; contrast his unshed, weirdly sparkly body with his head. He won’t show his true (adult) colors for a while yet. I’m very curious to see what colors he’ll turn out to be. 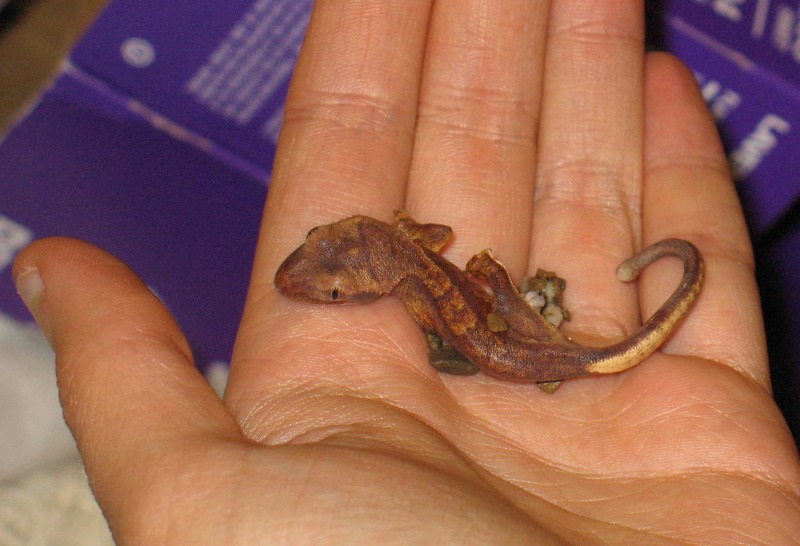 Crestie color genetics haven’t been worked out, so it could definitely be a surprise. I’m hoping he’s a good omen for this field season! Wow! What is “nesting material”? Might the other egg hatch now too? Do you have to keep baby separate from mom & pop? (Are they still in same cage?) Does baby eat bugs? Nesting material is mossy stuff that the female can dig and lay her eggs in. Hatching material is what you then put the eggs in when you remove them. In my case it’s basically gravel, which allows you to add water to keep it humid without the water actually touching the eggs. Eggs and babies are kept separate from parents. The parents would almost certainly eat the baby. The baby isn’t eating yet (usually takes a few days) but once he is, he would eat small enough bugs. I don’t have easy access to bugs so I’m just feeding him gecko food mix. The other egg definitely might hatch. When I hold it up to a bright light I can see a distinct shape inside. Fingers crossed! 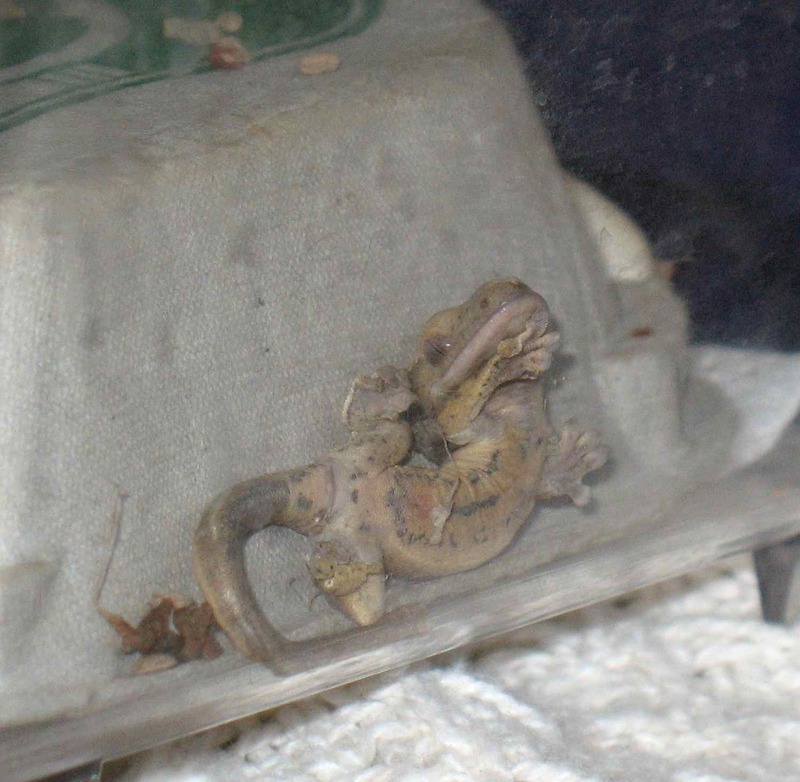 Hi Alisa, house geckos aren’t my area of expertise, but in general bigger geckos will eat smaller geckos. If you have any size differences, as it sounds you will, you will want to separate the larger from the smaller ones so that they don’t eat each other. It sounds like it would be a good idea to keep the three just-hatched ones in one cage and get a different cage for any babies that hatch in 2 months.